Our wonderful 4 Star apartments are the perfect way for you to enjoy all that the city has to offer. Beaufort Court is situated in Easton, on a flat area, half a mile from Bristol City Centre, approximately 10 minutes walk from Cabot Circus. We provide 10 self-catering apartments which give you all the freedom of a resident with your own fully-furnished apartment, including TV with Freesat or Sky, comprehensively equipped kitchen, secure parking, wireless broadband access and 3 of them are situated on the ground floor. Our serviced apartments are your own home from home while you’re staying in Bristol. The nearest railway station is Temple Meads: 1.5 km from Beaufort Court. Taxis are available at the station but there is a local taxi service that has accessible taxis if required. There is a bus stop right outside Beaufort Court itself. There are several regular buses: the routes 4, 24, 48, 49, U3 and N2 are the main bus routes into Bristol City Centre. The streets in the area surrounding the property are paved. Access statement can be provided in large print. We have an Electric Entry System. At the gate entrance, please call No1 on the intercom to get our attention. There is a secure on-site parking with 15 spaces available at £8 per night; otherwise on street parking is available at about 100m from Beaufort Court. The surface of the driveway and parking is level, flat and cobbled and the area is well lit at night. There is a ramp for the access to the reception area with a handrail on one side where guests are welcomed. The front door has one step 10cm high and 43cm wide and a kerb 15cm high (frame of the door). The door is 78cm wide; the handle is 106cm high. The floor is hard wood flooring. There is a desk 108cm high; the distance from the main entrance to the desk is 143cm; the room is approximately 226cm wide. 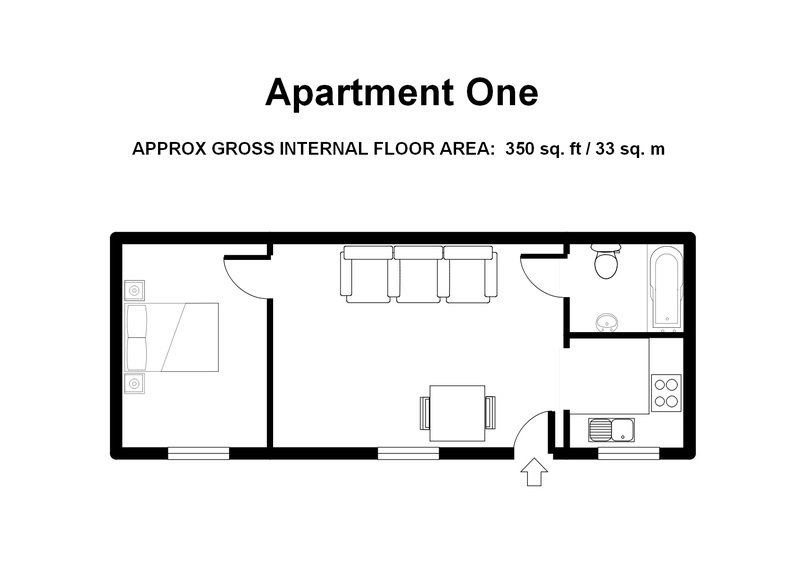 This apartment is situated on the Ground floor; there is a paved path way 0.9m wide x 3.5m long; this is the door is straight ahead. The door is 78 cm wide; the floor is hardwood flooring. 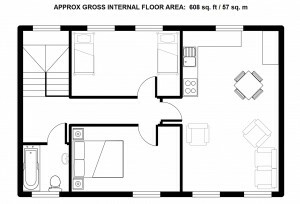 The entrance width is about 98cm; the size of the room is 2m x 1.90m and offers a fully equipped kitchen; the height of the kitchen workshop is 92cm. The size of the room is 3.43m x 4.80m. There is a black leather sofa, a low table and a dinning table with chairs, 42” flatscreen TV with remote control, teletext and subtitles. Room is bright and evenly lit; overhead lighting is controlled by a dimmer switch; bedside lamps are also in the room. The size of the bath is 2m x 0.7m; washbasin is 85cm high with a pair of taps; toilet is 42cm high. Well lit with overhead lights and a shaver light over mirror. White floors, blue tils, white towels. There are 4 steps for the access to those 4 apartments. The stairs are 65 cm deep, 89 cm wide and 6 cm high. There is also a ramp but no handrail. The apartment 6 is on the ground floor and the apartments 15, 16 and 17 are on the first floor. For the access to the first floor, there is a secure door with a code, which is provided on arrival. This door is 80cm wide and has one step 20cm high. There is an entrance lobby of 82cm by 72cm followed by 15 steps. Each step is 90cm wide, 19cm high and 28cm deep. The handrail is approximately 78cm high. The upstairs corridor is 86cm wide and 300cm long. The stairs and landing are covered with carpet. The walls are white painted and the light comes on automatically by remote sensor. The main door is 75cm wide with a step of 15cm high; the floor is hard wood flooring. 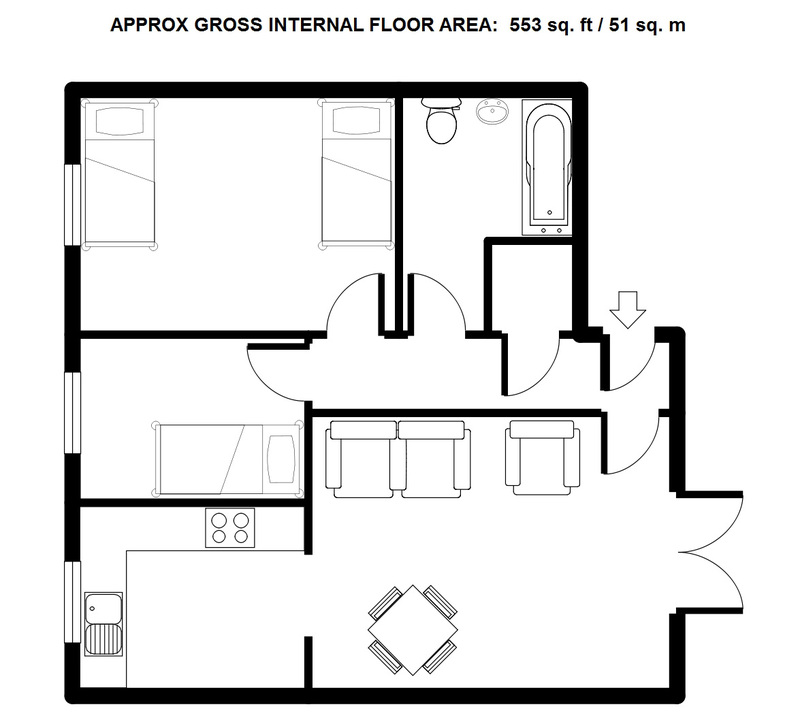 There is an access by the bedroom if required; the window door is 1m wide. 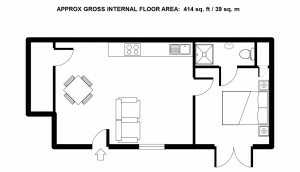 Kitchen and living area: the size of the room is 5.4m x 4.1m and offers the following: a black leather sofa, a low table and a dinning table with chairs and a fully equipped kitchen; the height of the kitchen workshop is 92cm; 42” flatscreen TV with remote control, teletext and subtitles. 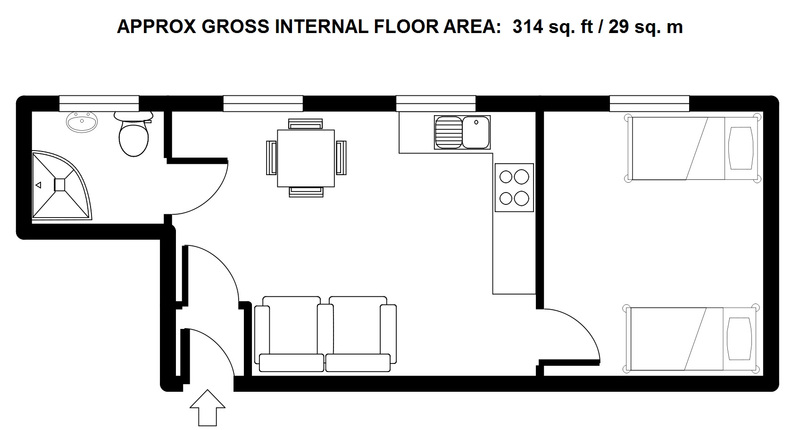 Bedroom: this is a double bedroom; the size is about 3.1m x 2.9m. The bed is 63cm high to the top of the mattress, the bed is at about 80cm from the wall on both sides and can be removed on request. Bed linen is white cotton with brown valance, red cushions and accessories. Room is bright and evenly lit; bedside reading lamps are provided in each room. The door is 78 cm wide; the floor is hard wood flooring. The hallway is 2.50m long and 95 cm wide. 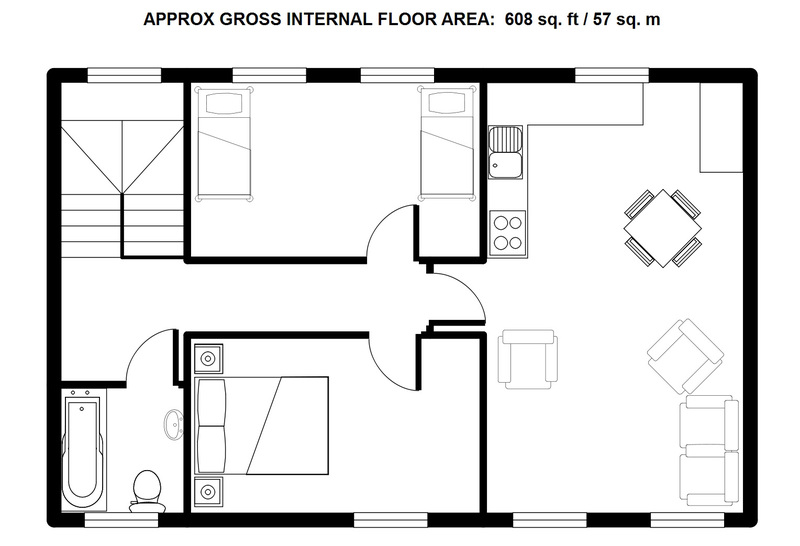 Kitchen and living area: the door width is about 71cm; the size of the room is 3.9m x 4.2m and offers the following: a black leather sofa, a low table and a dining table with chairs and a fully equipped kitchen; the height of the kitchen workshop is 92cm; 42” flatscreen TV with remote control, teletext and subtitles. 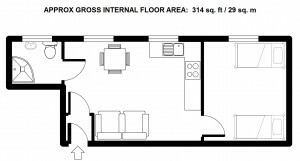 Bedroom: this is a double bedroom; the size is about 3.3m x 3m. The bed is 71cm high to the top of the mattress, the bed is at about 112cm from the wall on both sides and can be moved on request. Bed linen is white cotton with brown valance, red cushions and accessories. Room is bright and evenly lit; bedside reading lamps are provided in each room. The door is 78 cm wide; the floor is hard wood flooring. Bedroom: this is a twin bedroom; the size is about 3.4m x 2.8m: the beds are 63cm high to the top of the mattress, with about 1.4m between beds and can be moved on request. Bed linen is white cotton with brown valance, red cushions and accessories. Room is bright and evenly lit; bedside reading lamps are provided in each room. The door is 78cm wide; there are 13-carpeted stairs for the access to the 2nd floor: 73cm wide, 25cm deep and 20cm high. The hallway/landing is 5.10m long and 80cm wide. 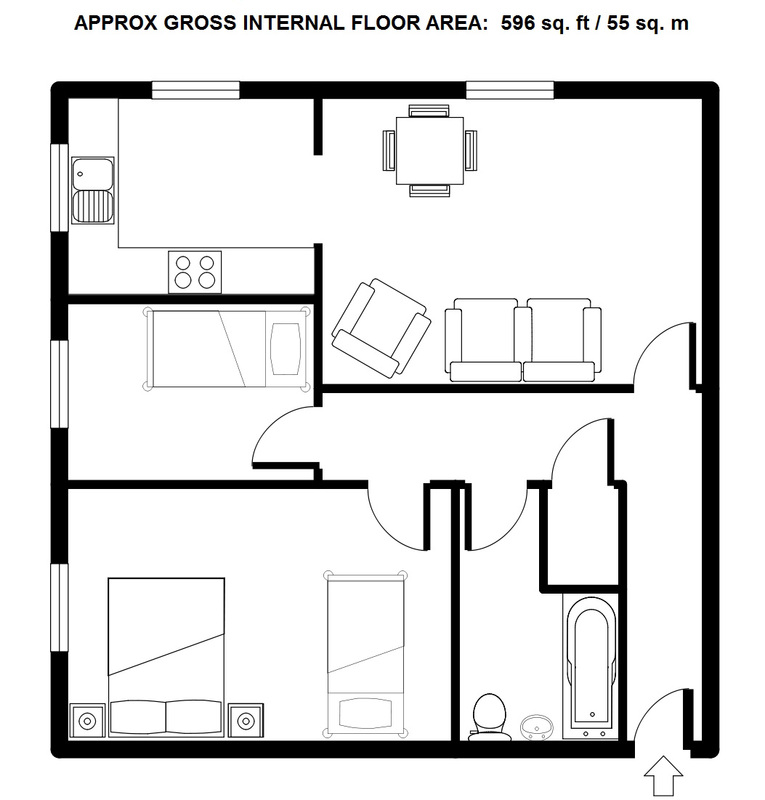 Kitchen and living area: the door width is about 71cm; the size of the room is 3.6m x 6m and offers the following: black leather sofa and armchairs, low table and a dining table with chairs and a fully equipped kitchen; the height of the kitchen workshop is 92cm. There is a 42” flatscreen TV with remote control, teletext and subtitles; the floor is hard wood flooring. Bedroom 1: this is a twin bedroom; the size is about 2.4m x 4m. The beds are 63cm high to the top of the mattress, with about 1.9m between beds and can be moved on request. Bed linen is white cotton with brown valance, red cushions and accessories. Room is bright and evenly lit; bedside reading lamps are provided in each room. Bedroom 2: this is a double bedroom; the size is about 2.4m x 4m. The bed is 63cm high to the top of the mattress; with a distance of about 50cm from the wall on both sides and can be moved on request. Bed linen is white cotton with brown valance, red cushions and accessories. Room is bright and evenly lit; bedside reading lamps are provided in each room. There is a ramp for the access to those apartments with a handrail on one side. The main door situated on the ground floor and is secured with a code, which is provided on arrival. This main door is 80 cm wide. 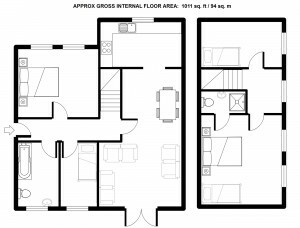 There is a large entrance lobby with a door on the left for access to apartments 2 and 3 (both are on the ground floor) and for wheelchair accessible. The staircase leads to the upper floor apartments: 7 and 8 situated on the 1st floor and 12 on the second floor. There is a hallway of 95cm wide and 4.4m long for the access to the bedrooms. Bedroom 1: this is a double and single bedroom (one double bed 1 single bed); the size is about 2.9m x 4.6m: beds are 63cm high to the top of the mattress, with a distance of about 1.3m between beds and 60cm to the wall which can be moved on request. Bed linen is white cotton with brown valance, red cushions and accessories. Room is bright and evenly lit; bedside reading lamps are provided in each room. Bedroom 2: this is a single bedroom; the size is about 2.1m x 2.8m; the bed is 63cm high to the top of the mattress, with a distance of about 1.1m from the wall. Bed linen is white cotton with brown valance, red cushions and accessories. Room is bright and evenly lit; bedside reading lamp is provided in each room. 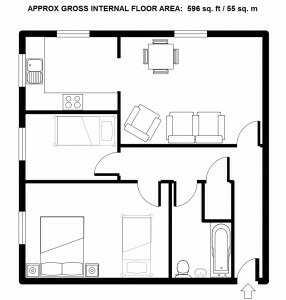 Kitchen and living area: the front door width is about 71cm; the hallway is 1m wide and 3m long; the size of the lounge is 3.4m x 4.4m and the kitchen is 2.3m x 2.9m and offers the following: black leather sofa and armchair, low table and a dining table with chairs and a fully equipped kitchen; the height of the kitchen workshop is 92cm. There is a 42” flatscreen TV with remote control, teletext and subtitles. Bedroom 1: this is a twin bedroom; the size is about 2.95m x 4m: beds are 63cm high to the top of the mattress, with a distance of about 1.5m to the wall, which can be moved on request. Bed linen is white cotton with brown valance, red cushions and accessories. Room is bright and evenly lit; bedside reading lamps are provided in each room. Bedroom 2: this is a single bedroom; the size is about 2.1m x 2.8m; the bed is 63cm high to the top of the mattress, with a distance of about 1m from the wall. Bed linen is white cotton with brown valance, red cushions and accessories. Room is bright and evenly lit; bedside reading lamp is provided in each room. 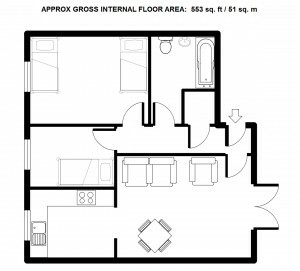 This apartment is situated on the first floor; access by staircase only. The handrail is 85cm high. There is a large entrance lobby with a door for access to apartments 7 and 8. This is the door on the left and is 70cm wide. There is a hard wood flooring entrance 85cm wide and 2.10m long and hallway 93cm wide and 6m long with 4 steps 18cm high and 33cm deep for the access to the lounge and kitchen. Bedroom 1: this is a single bedroom; the size is about 1.80m x 3m. The bed is 71cm high to the top of the mattress, with a distance of about 1m from the wall. Bed linen is white cotton with brown valance, red cushions and accessories. Room is bright and evenly lit; bedside reading lamp is provided in each room. Bedroom 2: this is a twin bedroom; the size is about 3.20m x 3.70m. The beds are 71cm high to the top of the mattress, with a distance of about 53cm from the wall and 43cm to the radiator/wall – can be moved on request. Bed linen is white cotton with brown valance, red cushions and accessories. Room is bright and evenly lit; bedside reading lamp is provided in each room. Bathroom: door opening to the bathroom is 72cm wide. The shower cubicle has a step/edge of 25cm high and its size is 90cm x 90cm x 100cm; washbasin is 83cm high; toilet is 42cm high. Well lit with overhead lights and a shaver light over mirror. White floor tiles, marble effect wall tiles, white towels. 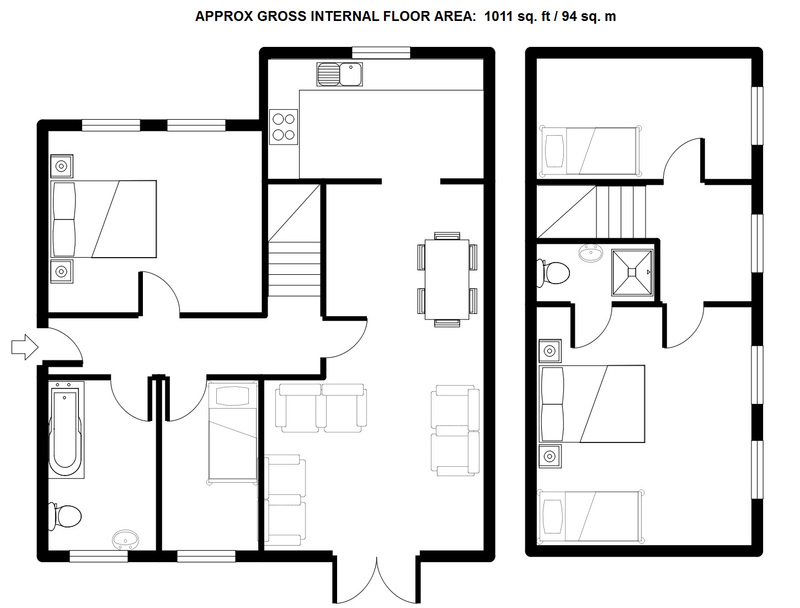 This apartment is situated on the first floor; access by staircase only. This apartment is situated on the second floor; access by staircase only (28 stairs in total: 95cm wide, 26cm deep and 21cm high) with 3 landings; the handrail is 85cm high. There is a hard wood flooring hallway 95cm wide and 6m long with 2 steps 13cm high and 33cm deep for the access to the lounge and kitchen. Bedroom 1, downstairs: this is a single bedroom; the size is about 1.80m x 3m. The bed is 63cm high to the top of the mattress, with a distance of about 1m from the wall. Bed linen is white cotton with brown valance, red cushions and accessories. Room is bright and evenly lit; bedside reading lamp is provided in each room. Bedroom 2, downstairs: this is a Twin bedroom; the size of each bed is about 210m x 3.80m. The beds are 63cm high to the top of the mattress, with a distance of about 80cm from the wall and 80cm to the radiator – can be moved on request. Bed linen is white cotton with brown valance, red cushions and accessories. Room is bright and evenly lit; bedside reading lamp is provided in each room. Bedroom 3, upstairs: this is a double bedroom; the size is about 4.10m x 3.80m. The bed is 63cm high to the top of the mattress, with a distance of about 1m to the wall – can be moved on request. Bed linen is white cotton with brown valance, red cushions and accessories. Room is bright and evenly lit; bedside reading lamp is provided in each room. Bedroom 4, upstairs: this is a double and single bedroom (one double bed and one single bed); the size is about 4.20m x 3.80m. The beds are 63cm high to the top of the mattress, with a distance of about 110m to the wall and 50cm between beds – can be moved on request. Bed linen is white cotton with brown valance, red cushions and accessories. Room is bright and evenly lit; bedside reading lamp is provided in each room. 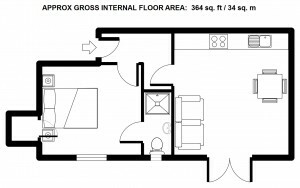 Upstairs bathroom, en-suite: door opening to the bathroom is 74cm wide. The size of the shower cubicle is 90cm x 70cm; washbasin is 84cm high; toilet is 42cm. Well lit with overhead lights and a shaver light over mirror. White floor tiles, blue wall tiles, white towels. Bedroom 1: this is a double and single bedroom (one double bed and one single bed); the size is about 2.9m x 4.6m: beds are 63cm high to the top of the mattress, with a distance of about 1.3m between beds and 60cm to the wall which can be moved on request. Bed linen is white cotton with brown valance, red cushions and accessories. Room is bright and evenly lit; bedside reading lamps are provided in each room. All public areas, halls, stairs, landings are either carpeted or hard wood flooring. They are all well lit using ceiling lights that come on automatically at dusk and also incorporate emergency lightening in the event of power failure. All exits are marked with aluminous signs in the event of emergency evacuation. A fire detection and alarm system is fitted to all the apartments to help ensure the safe evacuation of people in the event of a fire. If you require more assistance for evacuation, please notify us on arrival and we will ensure you are evacuated safely. 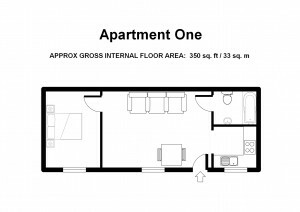 Full details are provided in the Welcome Pack in each apartment. Registered guide and hearing dogs are welcome. Hours Of Operation: Monday to Friday, from 9am until 6pm, or by arrangement if outside of these times.